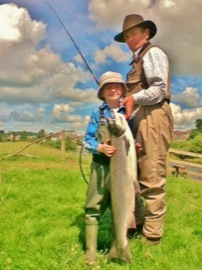 6 year old Tom Vickers and his Dad with a 16 pound salmon from Junction 27 July 2012. This entry was posted in Uncategorized and tagged Angling, fishing, FishTweed, Junction, River Tweed, salmon, season 2012. Bookmark the permalink.